Harley is losing it with young people in America, and it’s not because the bikes are bad, as Regular Car Reviews explains. It’s because the bikes are un-ownable. They can’t escape the microcosm of Harley-Davidson the brand. Again, Mr. 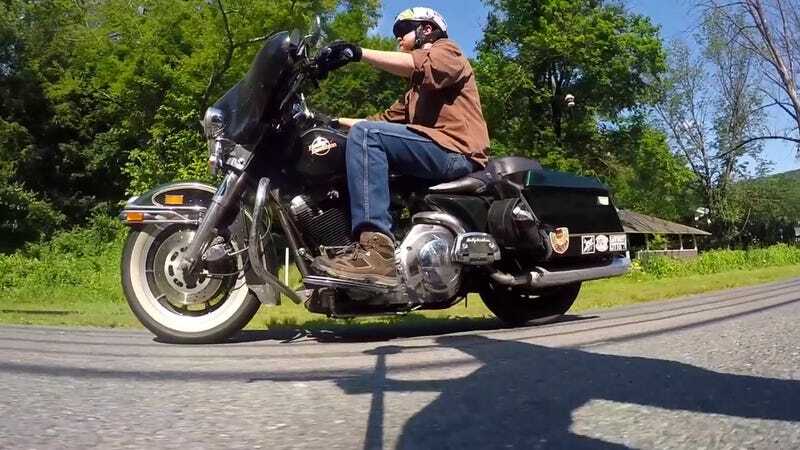 Regular explains that a regular Harley (in this case a 1990 Harley Davidson FLHTC Electra Glide) is great at what it’s meant to do. It’s easy to ride, it’s not so powerful that you can’t wring it out even in normal trips, and it has an eager quality that encourages you, convinces you to take it on long journeys. That’s the Harley ideal, and a Harley does it well. But the cheap-cigar-chomping, grey-goatee-having owners riding playing both sides of rebellion and the establishment is too strong of an association to ever think about owning one of these things. I don’t know if Harley the company can survive after all the last of the Boomers die off, but also I don’t see how it can really live until they’re all gone.